An inspirational and innovative project that is turning little used farm paddocks into productive market gardens while helping refugees on a pathway to economic independence is quietly making a big difference in a small Queensland town. The Mulberry Project has seen unused farmland transformed into verdant gardens where African refugees grow and share vegetables from their home countries and learn skills that can lead to jobs. The social enterprise project began in Nobby, a town 40km south of Toowoomba, on Queensland’s Darling Downs. It is the brainchild of Louise Noble who was picking mulberries on her family property with some friends. “It was in October 2016 and we had had a lot of rain which gave us a bumper crop of mulberries. I had invited everyone I knew to come and pick them and one of our African friends said ‘what’s all this dirty grass doing here, why aren’t you growing anything?’ The project grew out that conversation,” Ms Noble said. Now lush crops of amaranth and molokhiya greens, chillies, white corn, okra, cassava and tomatoes are the result of the project’s vision to give refugees a connection with their traditional foods and an opportunity to achieve social and economic participation. 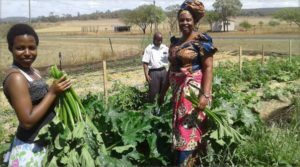 Initially, Ms Noble enlisted the help of a local farmer to cultivate 500 square metres on her property, and within a few weeks, migrant families from the area were planting and managing crops. Now, there are garden sites in Toowoomba and at Allora, 50km to the south of the town. Ms Noble says the culture shock and difficulties associated with migrating to a new country as a refugee are extensive, and finding the right food is no different. “A healthy diet is a problem for a lot of migrant communities, particularly in regional spots like Toowoomba. We’ve got a significant refugee community in the region, and many have a lot of trouble finding the food that they would prefer to eat,” she said. Neighbours started pitching in by digging up the soil and donating cow manure. The African refugee community in Toowoomba has spent hours with Ms Noble planting seeds, nurturing seedlings, and turning the “dirty grass” into a vibrant garden with more than 40 different plants for personal use and selling at markets across southern Queensland. “It’s been astonishing to see all these different plants,” Ms Noble said. “They’re really hardy and I’ve loved learning more about plants I thought I knew. “For instance discovering that rosella leaves are downright delicious, and the stalks and leaves of zucchini are edible too. “It’s a great way of getting an additional crop and making the best use of what you have. And it actually helps the plan,” she said. The members of The Mulberry Project are African migrants many of whom have suffered the trauma of war and the loss of loved ones. Because of war and genocide many of them have spent long and difficult years in refugee camps before finally finding a safe home in Australia. Ms Noble said the aim of the Mulberry Project was to provide short term and long term employment for new migrants. “What we are trying to do is enable social and economic inclusion through Fair Food production,” she said. 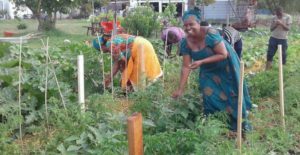 “We transform under-utilised farmland into market gardens to create pathways to training and meaningful employment in the farming and food sectors for disadvantaged communities. “Our dream is to rethink settlement by developing a model for social and economic inclusion through sustainable food production across the country – from the actual growing, to food safety and hygiene, managing the markets, sales, and learning about a small business,” Ms Noble said. With the help of Toowoomba’s Cultural Diversity Hub, a garden has now been established at the hub which is more accessible for recently arrived refugees. The site at Allora, which is on land donated by the Anglican Church, is a potential resettlement zone. “The local community at Allora has said they would like to see refugees settle in the town, so we are looking at the potential for relocating families there,” Ms Noble said. “Last Friday we had a bore on the property restored so now we can irrigate the gardens. There are some exciting potential opportunities,” she said.